Exhibition on the Brussels Royal Quarter at the BELvue Museum. Brussels. Organized by the Cercle d'Histoire de Buxelles to celebrate its thirty years of existence, the exhibition includes numerous photos of the old Isabelle quarter, where the Heger Pensionnat attended by Charlotte and Emily Brontë once stood. This quarter was almost completely destroyed in the early 20th century to facilitate various urban projects, including the infamous Nord-Midi rail Jonction; the selection of photos and slides on display helps revive its memory. 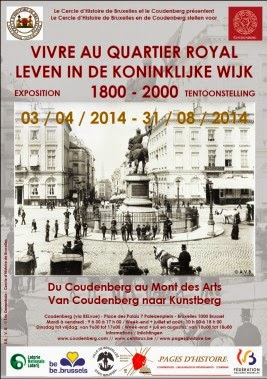 The exhibition runs until 31 August 2014 and entry is via the BELvue museum. The exhibition itself is housed in the Hôtel d'Hoogstraeten, which stands opposite the BELvue, across the Rue Royale. To reach the Hôtel, the visitor descends into the labyrinth of halls and passages which lie beneath the Place Royale – the remains of the Coudenberg Palace destroyed by fire in 1731. These subterranean vestiges include a small section of the original Rue d'Isabelle which managed to avoid later destruction. The exhibition catalogue, on sale at the BELvue shop, is excellent. It features a long and highly interesting article by François Samin on the history of Rue d'Isabelle and Le Grand Serment des Arbalétriers. 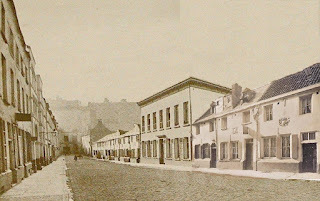 The Heger Pensionnat garden on the Rue d'Isabelle, so memorably described in Charlotte Brontë's Villette, had once been home to the city's important Guild of the Crossbowmen. Samin's article includes a wealth of little-known facts and documents related to the guild's history and its former exercise garden. It merits the attention of anyone interested in the Brussels of the Brontë sisters. For the celebrations of this year’s Brontë Weekend in Brussels, the members of our society convened in the usual location of Université Saint-Louis and welcomed a guest speaker from the University of Oxford, Dr. Nicholas Shrimpton, who was kind enough to share his knowledge about the social and literary context behind Charlotte Brontë’s Shirley. In a fascinating lecture, he presented evidence of an opinion some of us discussed earlier in the book club meeting – while not an instant classic, Shirley does have its strengths and remains an interesting read. And so, on one of the first days of spring, we’ve been told the story of a writer, who has embarked on an ambitious task of writing her sophomore novel “in a style entirely new”. one atypical story that came from Charlotte’s pen. Published as her second novel, it is a product of the author’s struggle with personal demons, but also of the problem of delivering something new and different, when one has only one previous experience to draw on. In her own attempt at revolution, she abandoned the single heroine of Jane Eyre, with her inner battle between stoicism and rebellion. Instead, she ventured to introduce two female characters representing the same juxtaposition in the flesh, illustrating parallel experiences rather than an individual one. On top of that, she expanded the picture with a number of key characters, who are not only introduced fairly late in the novel, but also tend to disappear from view for multiple chapters at a time. The story is not narrated by that single heroine anymore, but by an external third person narrator, omniscient if often using focalisation. And finally, we are relatively far removed from the familiar Brontë geography – while staying in Yorkshire, we move West from the country of moors, towards Leeds and its surroundings. The real-life location of the novel was supposedly Birstall, now graced with an IKEA retail park. Unfortunately for her, many view this attempt at innovation as only mildly successful: somewhat incongruous and decidedly less convincing than the heavily introspective works she’s best known for. Before sharing his own opinion, Dr. Shrimpton presented a vast perspective on possible sources of inspiration for this endeavour, which turns out to be necessary knowledge in order to fully grasp the meaning of the novel. Apparently, it could have been none other than W. M. Thackeray and his panoramic masterpiece, Vanity Fair, that served as primary influence on Shirley. It is no secret that they admired each other’s writing, despite their distinct characters. The monumental story of Becky Sharpe was being published in episodes at the time Charlotte was starting work on the new novel, and several hints of that impact can be identified in its contents. The most striking example being the opening paragraphs detailing the curates’ debauchery, inspired directly by Thackeray’s satirical tones. Arguably not as successful as the master himself, Brontë only barely managed to keep up with the sharp pace of satire, and was encouraged to omit that entire section by her editors. The fact that the opening scene and others that follow in similar vein are still there, might prove how strongly the author felt about going against the grain. In other clues, the action is moved back in time to Wellington’s era and aims to describe a wide range of social classes of the time, much like Vanity Fair. And finally, it goes on to fill one of the few gaps in Thackeray’s panorama and focus on the urbanising, industrial reality of the North of England. But while he manages to keep his characters in check through a powerful narrator figure, Brontë seems to have less control over her lot, and despite trying to emphasise the masculine voice of Currer Bell, she comes across thoroughly feminine in her storytelling. To further complicate things, halfway through her writing process, Charlotte was hit by a wave of misfortunes, as all three of her siblings died within a short period of time. As Dr. Shrimpton argued, some prolific writers like Frances Trollope were able to overcome their personal grief and produce masterpieces and their opus magnum even in times of grief. Miss Brontë was apparently not one of them. Insecure and always seeking reassurance with Emily, Anne or Branwell, she was not only mourning but also lonely with her incertitude. The tone of her writing changes visibly between parts 1 and 2 of the novel, and literally nothing is the same again after the tragedy strikes. Even Caroline’s eyes change colour in the process, if anyone needs tangible proof of incongruence. Fortunately, there is yet hope for Shirley. Our guest speaker pointed out that despite all the inconsequence, there seems to be a thematic unity within the novel, which starts with Chartism, “the unspoken subject of the novel”. Indeed, the topic of social struggles makes up for a big chunk of the novel’s story, but that doesn’t mean Charlotte equated the fighting Luddites from the beginning of the century, with the later Chartist movement, nor did she confuse one with the other. The Chartism in question is more likely the broad idea raised by Thomas Carlyle, of which the suffrage movement was only a symptom. It’s the general discontent of the working classes that flows steadily throughout the story, their struggle for food, education and dignity. Because of this widespread chartist spirit, the demand for “Condition of England” novels was going strong for many years, and prompted many writers to try their hand at portraying the ills of the working man, or at least incorporating some elements of it in their works. Maybe Charlotte is not as graphic dealing with this topic, as she usually is when digging through the layers of the inner conflict and romantic fever of her heroines, but she is successful in keeping the political theme of oppression a relevant element of her story. And maybe, it is not the panoramic Vanity Fair we should compare it to, but rather the more common attempts at addressing pieces of the “Condition of England” that we should treat as context of Brontë’s penchant for social issues in Shirley. The same thematic unity becomes even more apparent when we look at the broader picture outside the social issues the author raises. The very core of the story is driven by an almost philosophical juxtaposition between romantic egoism and the revival of pre-romantic rationalism. For the former, think Louis Moore with his ardent professions of love. The Byronic, individual experience linked to nature and its metaphors. Think chivalry, Wellingtonian heroism and war against Napoleon. Think, the lonely figure trying to help his mill off its knees. For the latter, go for Robert Moore and the pragmatic merchants. Go for the community of workers and the guarantee of employment they demand. Go for the idea of war as a nuisance menacing internal balance. This dichotomy goes strong throughout the whole story. Two heroines, two brothers, two opposing social classes, the individual and the disgruntled collective. And an opening that promises “[nothing] romantic” versus the ending that evokes seeing faeries. Don’t write them off as inconsistence – look how symmetrical and present they are. In conclusion, let’s not be afraid to admit that we’ve been discussing not the very finest of Charlotte’s work. It shifts the focus away from the conflicted introspection she is unsurpassed at, in favour a social engagement done more successfully by others. It is an inconsistent text plagued by the author’s suffering. And, as a question from the audience made us realise, one that would sadly be forgotten if it wasn’t for other, more successful Brontë novels. And yet, let’s keep in mind Dr. Shrimpton’s conclusion before we dismiss this novel as a failure. Charlotte put an extremely difficult task in front of her. She wanted to reinvent her well-rounded style, and took inspiration from intricate social situation and one monumental masterpiece. Only a select few in the course of history have managed to pull off a truly panoramic novel, and even those were not foolproof. This one is not really panoramic, but remains engaging and complex, and still masterfully soul-searching at times, which are some good redeeming qualities. Shirley may be a flawed and uneven work in many respects, but it is a hugely ambitious one to start with. Charlotte Mathieson, a research fellow at Warwick University who is researching the legacy of Charlotte Brontë in Brussels, joined us for the events of our annual Brontë weekend. She wrote this report on Nicholas Shrimpton’s talk for her own blog and has kindly allowed us to reproduce it here. 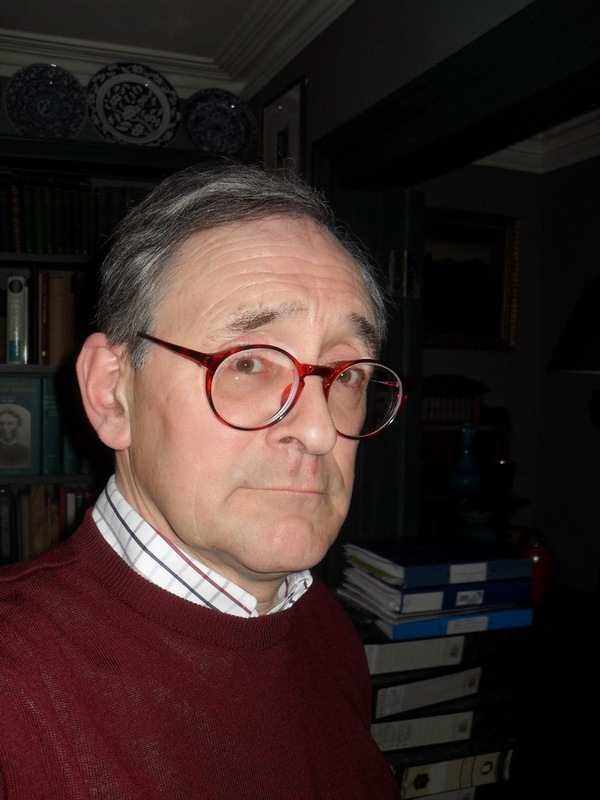 Although not a regular attendee of the Brussels Brontë group, I visited Brussels at the end of March to come to the annual Brontë weekend and had an excellent time at the various events, including the talk by Dr Nicholas Shrimpton from the University of Oxford. 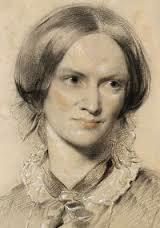 Dr Shrimpton’s subject was Charlotte Brontë's novel Shirley (1849). It’s fair to say that this is the least favourite of Charlotte Brontë’s novels, among readers and critics alike, and from the time of its publication to the present day has attracted far less interest than Jane Eyre and Villette. I'm in the minority who find the novel both enjoyable and of academic interest, and having taught Shirley a couple of times (on The English Nineteenth-Century Novel at the University of Warwick) I've definitely gained a much greater appreciation of it – it's a pleasure to teach as there is simply so much to say, and the novel is rich with interesting scenes to analyse in light of gender and political debates (it's also one of the few novels where I find myself wanting to really persuade students of how much they should love it, something I usually try to resist!). But it has to be said that much of this interest, and indeed the novel’s scope for analysis, comes from its problematic nature in terms of thematic and structural integrity. It this that formed the basis of Nicholas Shrimpton's talk, in which he assessed the case for and against Shirley, exploring in detail both the novel’s problems and its possibilities. Most interesting was that Shrimpton made the case for Shirley as a ‘panoramic’ novel on a par with Thackeray’s Vanity Fair: we know that Charlotte Brontë greatly admired Thackeray’s work, and Shirley, he argued, is her attempt at undertaking a novel of such scale and scope. Ultimately, it is hugely flawed, but it is also hugely ambitious. Shrimpton really captured that what makes the novel so exciting is the many fractures and disjunctures that occur throughout the text. 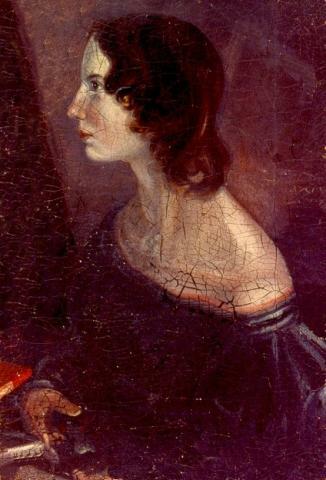 The text's handling of the "woman question", and its eventual 'failure' at sustaining proto-feminist arguments, is an apt case in point: while on the one hand, the final marriages of Caroline and Shirley come as a disappointment after the novel's earlier promise in questioning and challenging gender conventions, at the same time it is here that Brontë most usefully illustrates the strength of such conventions and the need for change - for both the women in the story, and for the woman writer, there simply is no other realistic option but to end with a marriage. Shrimpton also highlighted other contextual issues that are illuminating on how we read it - he focused particularly on the Luddite/Chartist conflation (or not), and also spoke of Brontë's worry that the text would be read as too similar to Elizabeth Gaskell's Mary Barton, published the year before. It was also interesting, in light of my literary geography excursion that weekend, to hear Shrimpton discuss the idea of 'Shirley country' (as distinct from 'Brontë' country') as well as talking about the novel's continental connections. The talk was an excellent reminder that Shirley deserves more attention as perhaps the most interesting, and certainly illuminating, of Charlotte Brontë's works.